Hope to be chatting with you on Sunday 6 August 2017. Has any one designed the perfect organiser? Is that possible? 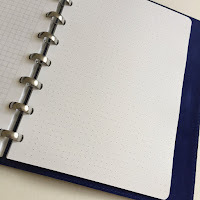 I had bumbled along with using an A5 and either a Personal or an A6 organiser until about a year ago, until I was asked to review the Filofax Heritage Compact A5 organiser. That was a 'light bulb' moment for me. It was the start of a major change in the way I used my organisers, and it has only deviated a little bit since then. The significant change was to stop using a smaller size as well as an A5 and stick to just A5, but split across two organisers. One for planning and notes, the other for reference pages such as addresses, maps, reference pages. The pages from one get moved in to the other and back again as the need arises. The 'reference' organiser has remained as one of my larger ringed Van der Spek A5 organisers, it sits at one end of my desk ready to hand when I need to refer to it, which isn't that often. 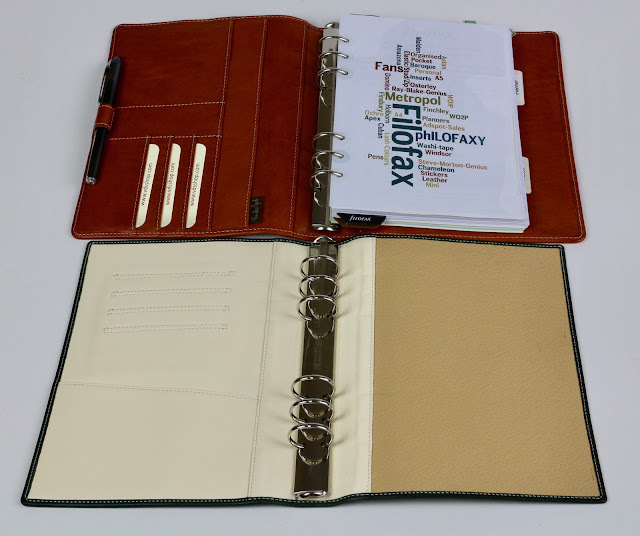 The Filofax Heritage Compact A5 organiser was a great starting point, with only 16mm rings it got me to take a critical view of what I was carrying in my planning organiser. I was surprised how much I could fit on to 16mm rings. 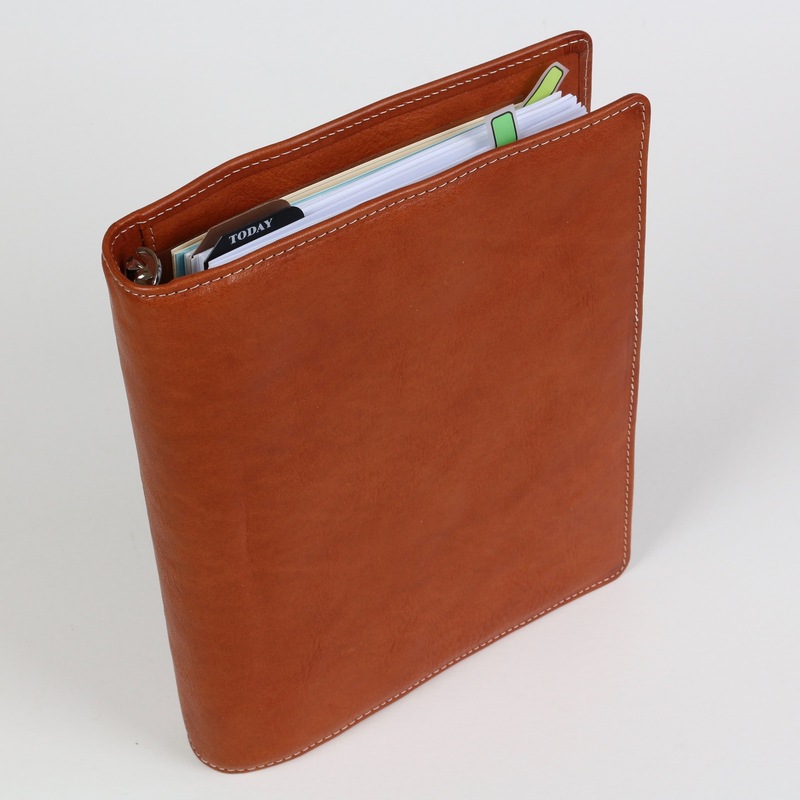 The lack of pockets apart from the ones on the flyleaf meant I was carrying cards and other essential paperwork in a Filofax Flex Slim. It worked but it would have been nice if everything was together. I then started looking at my collection in a new light, what else did I have with just 25mm rings or smaller in A5 size that might be able to work in a similar way to the Heritage A5. I tried a few out some for longer than others. The A5 Holborn with a clasp has 25mm rings, and an excellent internal layout. It works really well but it a little too stiff and structured, but I'm keeping it in reserve! The organiser section in the Gillio A5 Mia Cara was the next candidate. Simple like the Heritage, but the lack of pockets or a pen loop when used on its own and the width issue with side tabs sticking out was also an issue. The outer jacket though had lots of pockets so that helped, but I didn't want to have to carry both parts... if I could help it! I then started using a Van der Spek Custom A5 Manager in the Touch Me leather, this has been excellent in terms of what it carries, it is light weight and very flexible. By now I realised that 25mm rings gave me more than enough capacity and I am able to easily carry a full 12 months of weekly inserts, 12 months of monthly inserts and plenty of notes pages too. That would have been the end of the journey, until over Christmas I was looking again at the Mia Cara with thought to solving its issues and seeing if I could come up with a solution. Put simply we needed to make the organiser section wider! If you wanted to retain using the pen slot in the spine, then the outer jacket would also need to be wider as well. Without using the pen slot though there is ample room for a wider organiser section. So I sketched my design, I tried a full size cardboard prototype the proposed height and overall width, wrapped this around some 25mm rings and tried it out for size. It worked. So then I just had to decide on a detailed design. I've seen a lot of custom designs made by Van der Spek for people in our community, but actually designing one for your self helps you realise how much time and care you have to put in to the design if you want the final result you had been thinking of. For my design the rear cover would be left plain like the Gillio one, but I wanted it in full leather. So there are no pockets in the rear cover. The front cover though I had freedom to design what I wanted. I added a pen loop, this means I have a pen when I'm only using the organiser section on its own. I copied the design of the Van der Spek A5 I was using in terms of inside front cover layout. 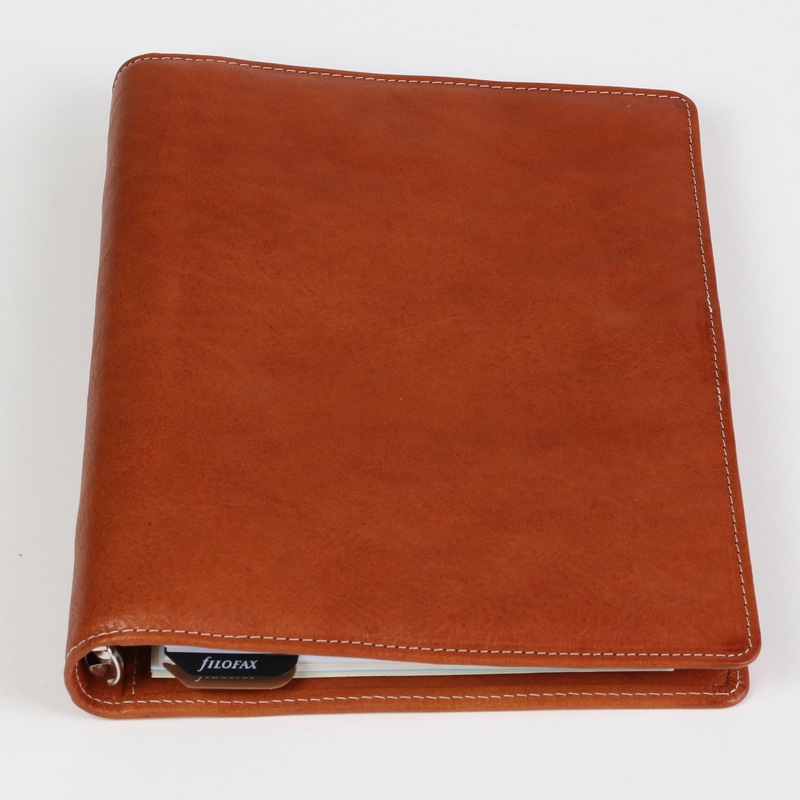 It has three vertical card slots, two different size, but wide slots that take cards or small documents. 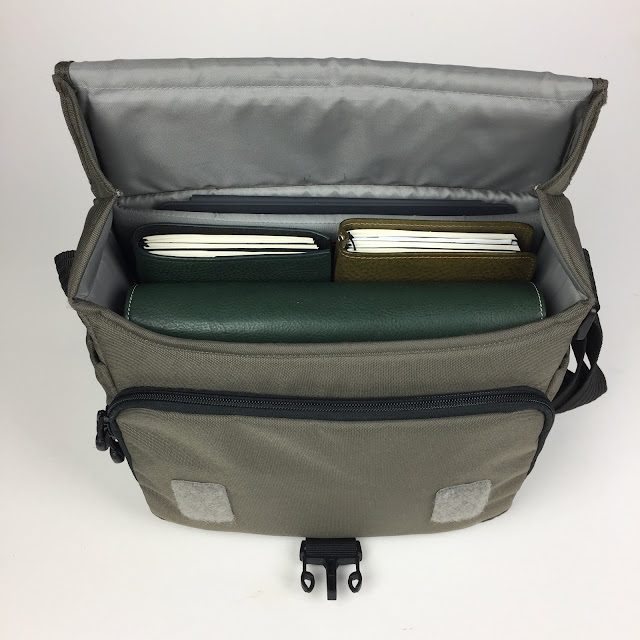 There are also two full height slip pockets. Quite comprehensive because once you add it to what the Mia Cara outer jacket has with even more card slots, vertical pockets, a zip pocket, popper pocket and full width back pocket, then yes it is quite a beast and easy to loose things in! So the new organiser section was made for me by Van der Spek. Marrying the two designs up in terms of leather finish and colour took a bit of work. 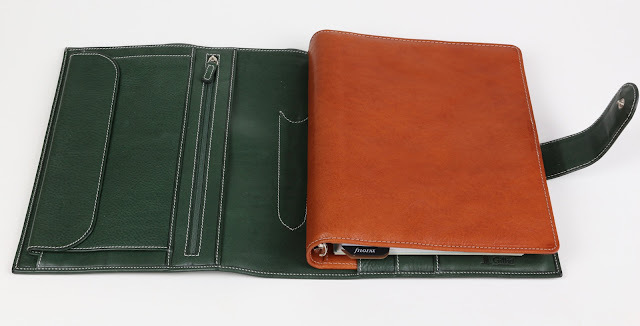 I took the A5 Mia Cara with me to the meet up in June and between Petra and myself we decided that the 'Janet Leather 104' was a nice contrast to the Mia Cara green. 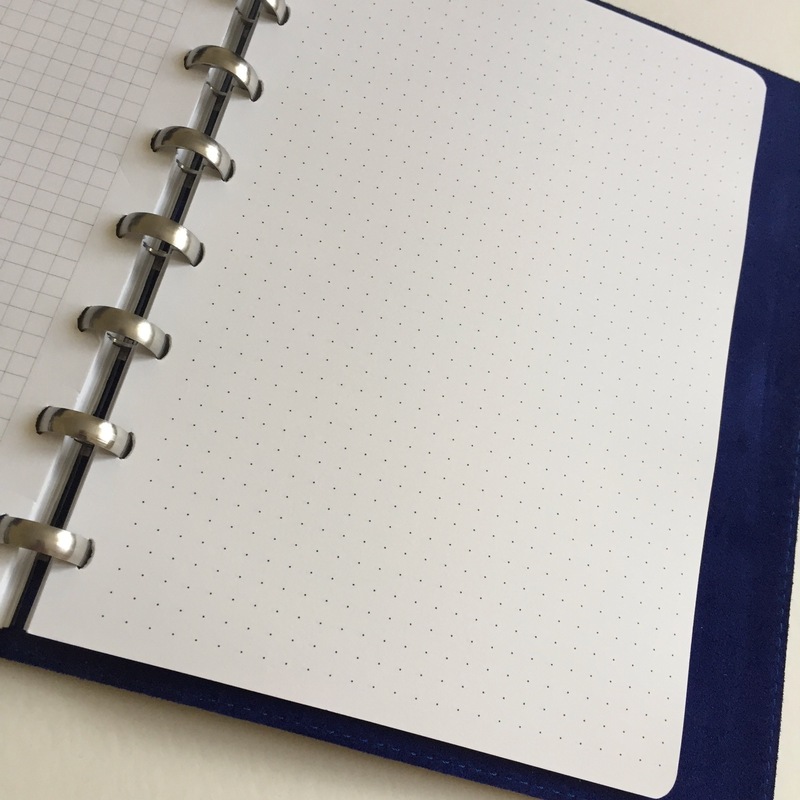 I also chose white stitching for the new organiser section. I was happy to settle with 25mm rings. It was very special to sit and discuss my design ideas with Petra who a natural flair for what can and can't be done with leather. I entrusted my modified drawing to Petra and the team and patiently waited for it to be made. This is the result. As you can see there's no clasp but that isn't a problem, because in the outer jacket that has a clasp. And here it is 'installed' in the Gillio Mia Cara outer jacket. I like the contrast between the two colours. The original Gillio organiser section is green and cream on the inside. I think the natural brown goes very well with the Gillio green. This shows the internal layout of the front inside cover with the pen loop as well. Closed with tabs and nothing sticks out the edge! I had the option of square or rounded corners. I picked rounded because it would then be easier to insert the organiser in to the outer jacket. 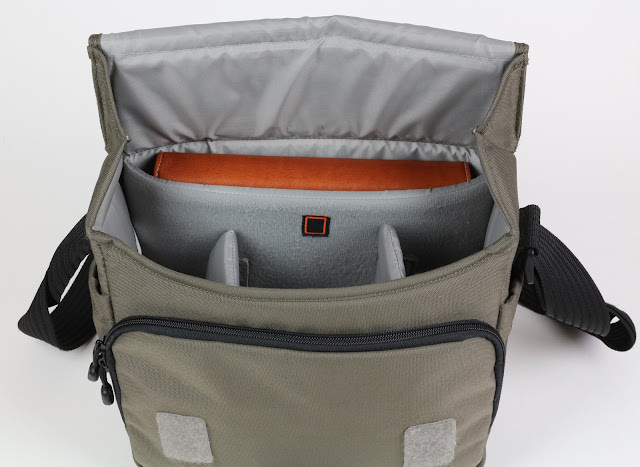 Very importantly, the organiser section fits in to the iPad slot of my small messenger bag perfectly. Or if I really need to take the whole organiser including the outer jacket, the dividers easily come out and I can carry it all including my Gillio Giramondo and Van der Spek Nomad Travellers Notebooks, and slotted in the back my iPad Pro, 'planning' for any eventuality! Here you can see the extra width compared to the Gillio organiser section. This photo also shows the difference in the internal layouts of the two. The difference in size and design to a conventional A5 are fairly small. I had to impose a maximum height of 230mm to ensure it slotted into the Mia Cara ok. This maximum height is very similar to other A5's I already own. It is surprising how much they vary in height. Overall width is the same as a normal 25mm ring A5 Manager at 405mm, the A5 Mia Cara insert measures just 375mm. I've really settled in to using this new combination organiser this week. So far I am really enjoying using it. I can now use my two luxury favourite brands in the one organiser! Thank you to Petra Van der Spek for her patience and helping making my dreams come true! If you have any additional questions please post them in the comments below. Yesterday I started planning another London Meet Up. Most probably at the end of September. 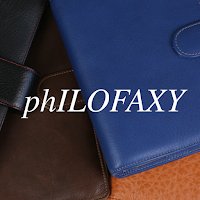 I really enjoy these events meeting up with other planner users and Philofaxy readers. They are quite relaxed events, so there is no need to worry about meeting other people and having to explain why you are a paper planner user... we all know! So today (Friday) I will be checking flight details and hotels etc. So look out for an announcement next week. Meanwhile it is Friday so feel free to discuss anything planner related, ask questions and so on. PlannerCon Europe is 28th and 29th October in Brussels, Belgium and there are going to be talks spread over the two days. There will also be shops set up over the two days as well. 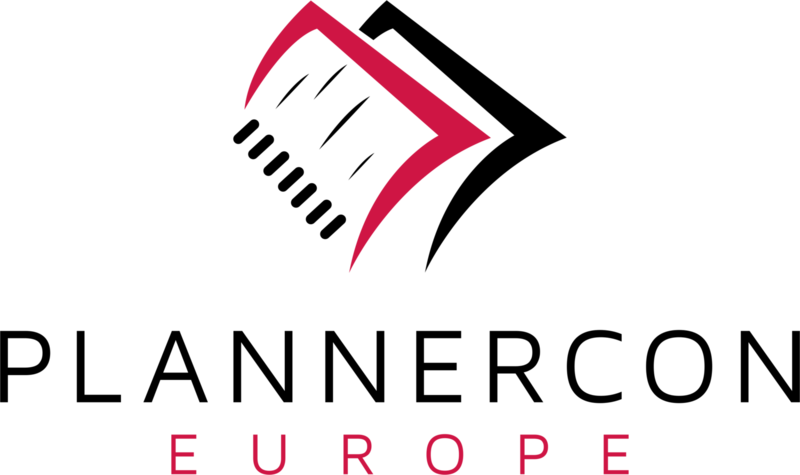 The list of speakers and sponsors for PlannerCon Europe is growing steadily. Here are the details of the speakers/workshops. Steve Morton on finding or creating the perfect planner. 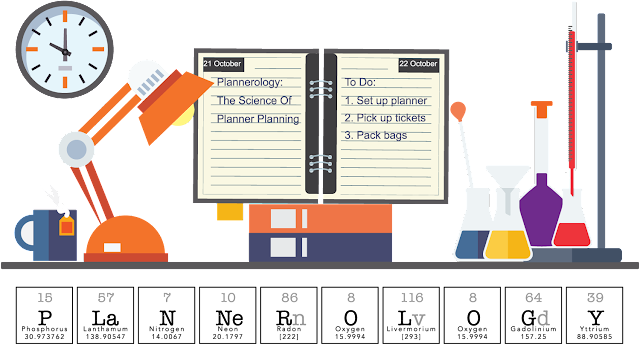 I will be using my wealth of experience with many different organisers and planners to explore all the facets of planner design to help people formulate their own perfect planner. Rebecca Jay from DodoPad will talk about how she created her brand and being a women entrepreneur in the modern Plannerverse. Theresa Hall will talk and show how to incorporate Bullet Journalling in to your daily planning routine. Other speakers as yet to be confirmed/revealed. Other sessions as yet to be confirmed/announced. Look out for more news and additional details on the Schedule page of the PlannerCon website. More companies are in the process of signing up for the event so there will be more announced soon. Tickets are still for sale for the event at the low introductory price, but for how long more I don't know... buy now it is now only 3 months away. Full details at the PlannerCon Europe website. What is the difference between long term planning (Macro) and short term planning (Micro) and how should you approach both forms of planning, are they different or the same. In this episode Karine and Steve try to dive in to this set of questions and discuss their approach to dealing with long term planning and mixing the two forms of planning to complete larger tasks and goals. 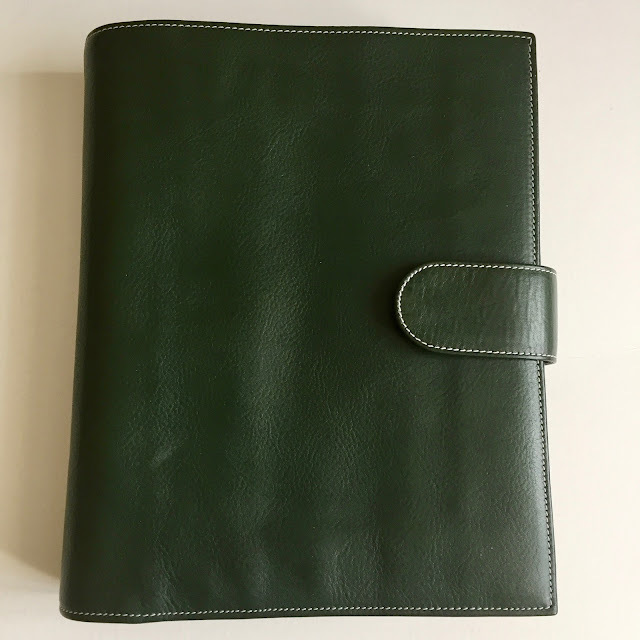 It has been over a year since I did my initial review of the William Hannah A5 leather disc-bound notebook/planner. A lot has happened since then, David Round (Owner of WH) has continued to work hard in developing the product and the brand in general. In May 2016 we created a small but friendly Facebook user group for William Hannah. It has about 170 members, it has grown slowly in the last year with people doing the usual thing of sharing photos and asking questions etc. David does the occasional live video to the group to bring us updates and show off new leather colours. Whilst these are live events, you can watch them at a later date if you missed them which is good. My punch should be with me in the next couple of weeks. I'm looking forward to creating some of my own inserts for my WH notebook to try it out in different ways. Other interesting news is that William Hannah is going to launch an A6 version of the William Hannah Notebook. The A6 model will have 6 discs compared to 8 discs on the A5, they will be the same diameter and the same spacing as the A5 model. 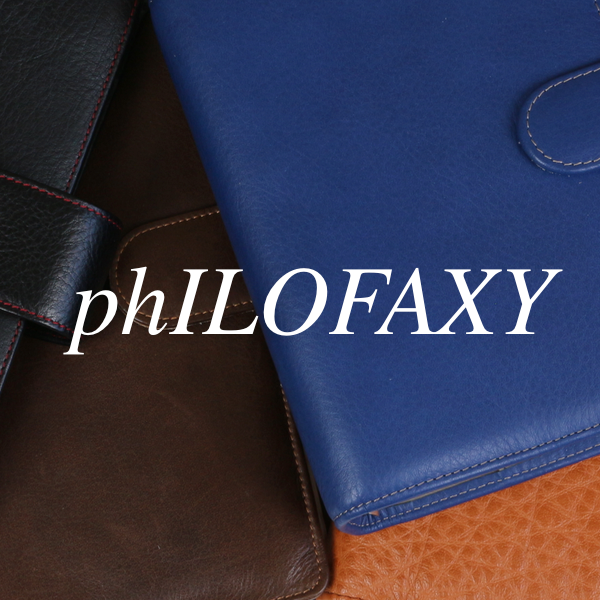 Once again there will be a selection of leather colour combinations available as 'off the shelf' models and like the A5 you will also be able to order bespoke combinations as well. Look out for news on this new product on the William Hannah website, address below. Like the A5 you will be able to order from William Hannah a selection of high quality paper packs in different styles for the A6 in the same way you can for the A5. The paper supplied by William Hannah is of exceptional quality, no surprise really as David is a fountain pen fan! In case you have been wondering about the Podcast.... Karine is now back in the USA and we will soon be getting started again on regular episodes. So what would you like us to talk about? We are happy to discuss anything planner related, not just ring bound planners, any sort of paper planners and how you use them etc. We have done 50 odd episodes already, nearly 60 if you count the ones we have done with other people or on our own. We are sure there is plenty of scope for other topics we haven't yet covered, or to revisit ones we have previously covered but may be revisit them from a different angle. So please leave your ideas in the comments below and we will do our best to add them to our list for the coming weeks. If you want to look at previous episodes please visit this link for the podcast episodes. Let's color our worlds today! Do you use colored pages or colored ink in your organizer? Is it an important part of your organization system, or do you do it just to delight the eye? Or do you like to see things in black-and-white? Maybe you can't see certain colors very well, or you find color distracting. Of course, since it's Friday, all ring-bound organizer discussion is welcome!